Simple details that look easy to morph can sometimes be more difficult than they may initially appear to be. For example, you may find that the nose becomes problem when performing a head rotation. As explained earlier, the drawings need to be similar in their number of shapes. 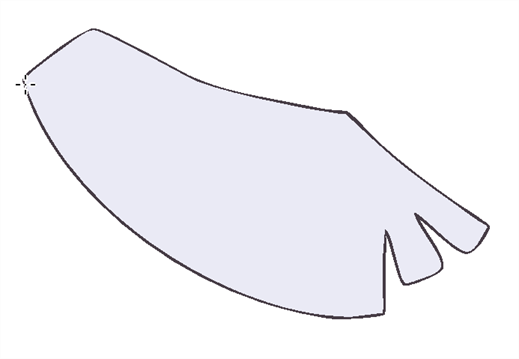 Generally, on a head rotation, the source nose is in the centre of the face, but on the destination, the nose line is part of the face outline. 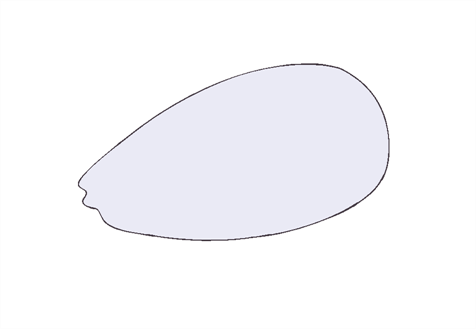 This means that on the source drawing, the nose and the face outline are two separate shapes, whereas they are combined into one shape on the destination drawing. Any shape that is contained inside another one and has to morph out of that shape will be a problem for the same reasons as the nose is. At some point during the morphing sequence, the shape contained inside the face will merge with the face outline, and then become a separate shape again. 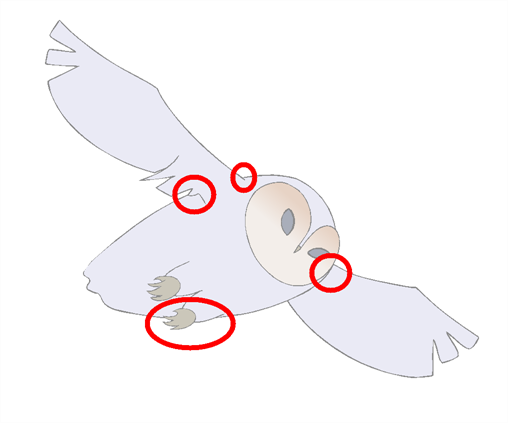 It is because of these reasons, explained in the Identifying Problem Zones section, that morphing layers exist. 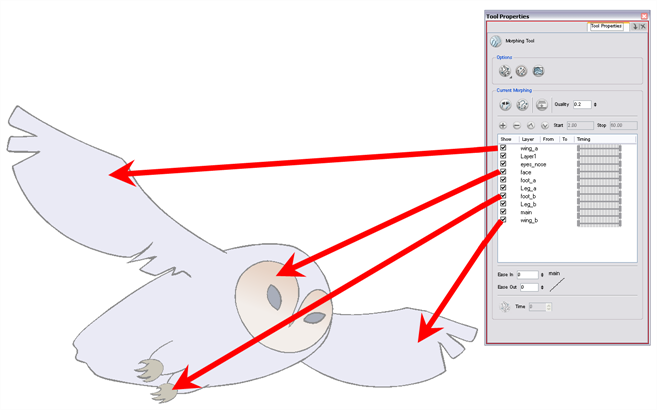 Morphing layers are all contained in the same drawing layer. It is like having a mini Timeline within a Timeline layer, or a mini Xsheet within an Xsheet column. Each morphing layer can have its own duration and velocity. Also, because you only have a single element to handle in your Timeline or Xsheet view, it will be treated as one element for the Compositing process, making the compositors work easier. You could separate all of your elements into different actual drawing elements and have many layers, but you would have to create a large number of morphing sequences and make sure that you modify all of their timings properly. Both solutions are correct, but morphing layers makes it easier to handle and does not change the scene structure by adding more elements which can be very important for Cut-out animation puppets. For example if you need to morph a front head to a three-quarter head where the ear needs to be separated, you do not want to add a new ear layer at the same time and have to worry about connecting it inside the puppet's construction. Instead, simply create an ear morphing layer within the head layer. When you click on a Morphing layer drawing, it automatically appears on top of the other ones. If you want it to stay in place, for example the wing behind the body, enable the Show Morphing in Place option in the Morphing tool Properties view. Use a naming convention for each morphing layer such as ear_1, ear_2 or head_1, head_2. You can also use the numbers 1 to 9 for the first layer, 10 to 19 for the second one, 20 to 29 for the third one and so one. This technique is useful if you plan to do more than one morphing sequence in the same column. 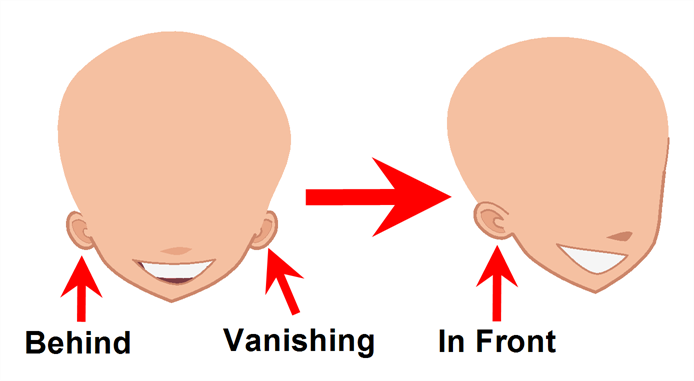 For example, front head to three-quarter head to side head. The three-quarter drawings will be used in both morphing sequences. 1. In the Timeline view, add a new drawing element and name it properly. 2. In the first cell, draw the main source shape such as the head shape or body shape. Do not add details like eyes. 3. In the Timeline View, select the destination cell, then enable and extend the Onion Skin. 4. In the destination cell, draw the second drawing. 6. 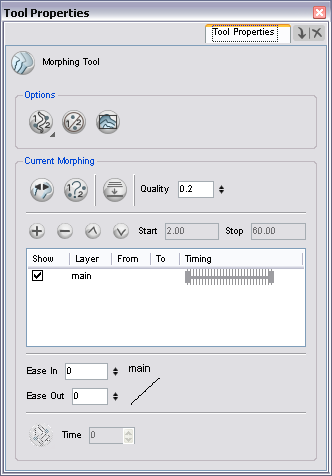 In the Tools toolbar, select the Morphing tool. 7. In the Morphing Tools Properties view, click on the Add Layer button to add a new morphing layer. 8. Double-click on the new layer's name and name it appropriately. 10. Use the Up and Down arrow buttons to move the new layer above or below the Main layer. 11. To create new drawings, double-click on the blank area under the From section to create the source drawing and the To section for the destination drawing and type a value different than the ones used for the main layer. ‣ You do not need to type any value for the Main layer as it uses the one from the Xsheet column. 14. In the Camera or Drawing view, draw the source drawing. 15. Once the source drawing is done, use the Morphing Tool Properties view and click on the destination drawing's name and draw it in the Camera or Drawing View. 16. Repeat steps Step 7 to Step 13 for each layer needed. You can add as many layers as you want. 17. Enable or disable the layers that you want to display or hide while drawing. 18. 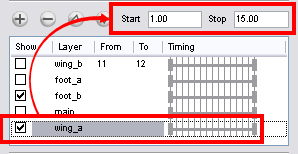 If you want to change the layer duration, click on the layer and change the start and stop numbers.